As a back pain sufferer, you undoubtedly already know that exercise is an important part of your day but often, the time it takes to do it discourages you from even starting, or giving up before you have really got going. There is another, far more efficient and effective way for you to exercise without having to go to the gym or take long arduous walks. That’s right, you can do your exercise as you go about your normal day to day routine just by concentrating on what you are doing and using your muscles and body in the right way. I have put together a free video which demonstrates lots of insightful tips on how to do this my daily exercise workout done standing still. With exercises like walking for example, you are using momentum to stroll without much thought being given to how your muscles are working while you are doing this activity. If you knew how to concentrate on switching your various leg muscles on and pushing off with them to go forward you would spend less time walking with a bigger benefit to all your muscles, yet you would get more benefit out of it. Next time you walk, purposefully use the heel toe action and different muscles in your legs to switch on and push off with. When you push off with your leg/ foot as you move forward, squeeze the muscles in your lower leg the moment before you push to activate them before you put them under load.. Then purposely release them as that foot lifts off the ground. You work your way around the body feeling which muscles you use throughout your various movements, and then when performing that action/ movement, concentrate on switching the right muscles on just as you put them under load, and release when you finish. Just this simple concentrated action will ensure that you can get more benefit out of a 20 minute walk than you would out of an hour long one. You can even do this when you are walking from one area to another at work or walking around home. Eventually you use this control all through everyday and your need to do external exercise to keep your body healthy and supple will disappear. . If you suffer from back pain, this technique will help re-train your weak or dysfunctional muscles which are an important part of your rehabilitation from this condition. 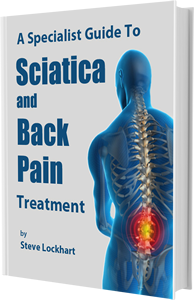 If you need more clarification on this and many other exercises and self treatment tip to help you recover from or prevent back pain or sciatica I wholeheartedly recommend my self-treatment program for back pain and sciatica sufferers. Many people spend most of their day sitting at a desk. They will invariably experience chronic back pain or sciatica at some point in their lives and at the very least, will feel like their body is frustratingly stiff from the lack of movement. When you sit for prolonged periods, there is a simple exercise you can do which will ‘switch on’ the muscles around your hips and pelvis. Put your feet on the floor in front of you and push your buttocks down into the seat whilst holding a slight arch in your lower back. Now drop all the tension from your shoulders and sit with an straight, upright back. You will be surprised by how quickly your muscles tire and how difficult it will be to hold that position strongly for any length of time. This will show you just how weak those muscles have become. However, if you do this regularly (for a few minutes every hour) you will soon loosen and strengthen these muscles at the same time. Your stiffness will disappear and you will begin to notice that you can hold the pressure a lot longer than you could when you first started. This will not only help you strengthen your muscles but it will also help to alleviate your back pain or sciatica. By holding this position and concentrating on keeping the pressure evenly distributed on both sides of your pelvis you will also become aware of, and be able to correct, any imbalances that you carry in your pelvis. With this in mind, I would recommend that for just a week, you take the time to think about what you are doing as you go about your day. Consider ways that you can still do exactly the same things while focusing some pressure on your muscles so that you give them a good strengthening workout as you go about your day. Then you can sit down and relax when you get home without feeling like you have to scurry off to the gym or go for a long walk, often the last thing we feel like doing after a long hard day at work. If you already suffer from back pain or sciatica, this little change in your routine will make a very big difference. When you walk up stairs, try doing it more slowly and deliberately and let your leg muscles do all the work. Intermittently switch from walking to running up the stairs as you push off with your legs so you get some cardio vascular fitness at the same time. If your job involves bending and lifting (a sure fire irritation for a chronic back pain or sciatica condition) be sure to use your legs to squat down and keep a straight back so as to strengthen your leg muscles and lower back rather than putting strain on it. If you can’t yet squat down, sit down on the floor to do what you need to then get yourself back up on your feet again. There’s a good little workout in that process alone. Treat the object you are lifting as a weight by sharing the weight evenly between both arms and hold it close to your body. It might not feel like a lot of effort each time you do it, but the accumulation of lots of little efforts makes a big difference and you will be surprised by how much strength and fitness you gain. There are many simple ways you can turn your day to day activities into a good all over workout. It just takes a little imagination, thought and practice until it becomes a habit. There are many other ways and little tips you can learn to help you better look after your body yourself and if you are trying to rehabilitate from back pain or sciatica my Self Treatment Program will be your perfect guide. I never felt it did my a lot of good but everyone said I should do it. Many thanks for the information. Very useful site, with lots of information. One thing though the idea is not to rush through the exercise but rather stop on each point so you give the balls a chance to sink into the muscles and release the tightness. Thanks for your suggestions though. Hi Dave, there is lots of information on the site that will hopefully help you. Important you diagnose where the offending muscles are and work on them, to me sounds like perhaps it would be the erector spinae muscles so the video at http://www.backpain.com.au/instantrelief is what will help. making my morning a little bit better with this great article! I think this is among the best back pain sites for me. And i love reading your articles. The website style is wonderful and articles really excellent.